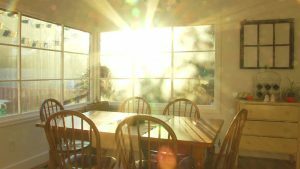 Rooms bathed in sunlight have about half as many viable bacteria as dark rooms, and almost no respiratory-disease-causing bacteria, a study published in Microbiome this month found. Folk wisdom has told us for centuries that sunshine helps keep us healthy, but new research helps explain why. Researchers at the University of Oregon set up several dusty, dollhouse-sized rooms, some with regular UV blocking glass, some with glass that let UV rays in, and some kept dark. They “inoculated” each of the rooms with bacteria-laden dust collected from actual homes in Portland and put them outside, while keeping the insides at a normal room temperature. After 90 days, they found 12 percent of the bacteria was still alive and viable (able to reproduce) in the the dark rooms. The rooms exposed to daylight through UV blocking glass had only 6.8 percent viable dust bacteria remaining, and the rooms that let UV light in had only 6.1 percent of viable bacteria surviving. Dust kept in the dark contained species of bacteria closely associated with respiratory diseases, which were largely absent in the rooms exposed to daylight. “Humans spend most of their time indoors, where exposure to dust particles that carry a variety of bacteria, including pathogens that can make us sick, is unavoidable,” said lead author of the study Ashkaan Fahimipour in a press release. In future studies, the researchers said they’d like to determine exactly how much light is necessary to kill microbes so architects can begin to design buildings with that in mind. Fahimipour warned against household cleaners claiming to kill 99.99% of bacteria, as completely eradicating microbes is impossible, and undesirable even if it were possible. Thank you for the info..I will share my new knowledge..
Bolstering beneficial microbes is always a good thing to do thanks for the article need to get this out there to more people so they can stop being afraid of “germs” and start finding symbiotic relationships woth microbes that will better their quality of life! Great information! I will open my windows and blinds when I can. There is not always sunlight and sometimes the sunlight heats the room up too much causing strain on the AC. I love windows but the problem with them is that they are poor at insulation and can cause heating and cooling bills to go up greatly unless some common sense is used. We need better windows!